From the mouth of the Nankoweap Canyon on the east to the Grand Wash Cliffs on the westmore than 200 miles by river the Grand Canyon maintains approximately the same 5,000-foot depth and a width between rims measured in terms of miles. All sections of the Grand Canyon are parts of one natural physiographic unit. 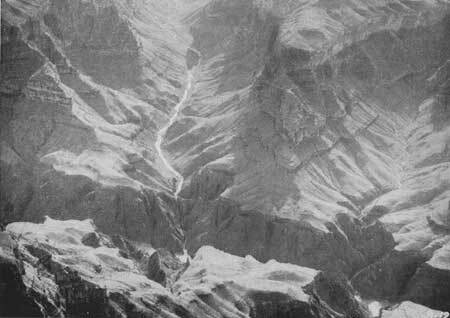 Although the general character and form of the canyon change greatly from place to place, there is an imperceptible transition from one section to the next, and all are inseparable parts of the one great canyon. Man-made boundaries in the Grand Canyon mean nothing as to the relative value of different portions. It is not possible to say that one part is either inferior or superior to another; each is different but each is great and part of the whole. 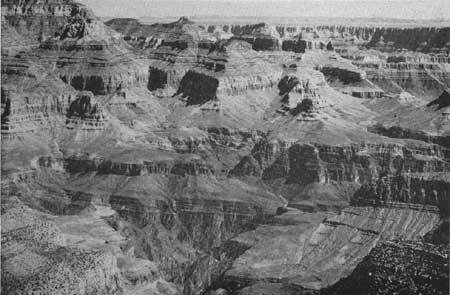 Figure 66.The Grand Canyon from Grandview Point. The inner part of the Grand Canyon which would be affected by the proposed Bridge Canyon Reservoir may be divided both scenically and geologically into four main divisions. The eastern division of the inner canyon, starting some miles above the mouth of Havasu Creek and extending almost to Toroweap Valley, is characterized by extreme narrowness of the gorge and by very high sheer walls of sedimentary rocks. Near the mouth of Havasu Creek, for instance, resistant beds of Muav limestone wall in the river and the soft shales that normally form the flat Tonto Platform below are not exposed, with the result that the inner canyon to a height of nearly 2,000 feet is extremely narrow, probably the narrowest within the entire canyon. From Toroweap Valley to Whitmore Wash and beyond, the scenery has been changed by the introduction of vast quantities of volcanic materials and the cutting of the river progressively deeper into the sedimentary rocks, with consequent widening of the gorge. The Toroweap section is one of the most spectacular and remarkable parts of the Grand Canyon. At the foot of Toroweap Valley the nearly vertical walls of the inner gorge rise almost 3,000 feet above the river. Great lava flows have cascaded down into the gorge and cinder cones perch on slopes within the canyon. On the rim of the gorge at the foot of Toroweap Valley stands a large cinder cone known as Vulcans Throne. Below Whitmore Wash the river turns south following the trend of several major fault linesespecially the Hurricane Fault to the north and the Peach Springs Fault to the south. The entire aspect of the canyon changes. It is considerably wider and cut into older rocks than those exposed in the Toroweap area. The most impressive part of this section is known as Granite Park. From the great bend of the Colorado River at the mouth of Diamond Creek westward to and beyond the Bridge Canyon Dam site, the Colorado flows through the lower Granite Gorge, and the scenery near the river resembles that in the inner gorge of the Bright Angel section. Above the inner gorge the Tonto Platform also shows a resemblance to the corresponding feature in the eastern section of Grand Canyon. On the south side of the canyon the great Cataract Plain extends west from the Williams-Grand Canyon Road to the Aubrey Cliffsunbroken except for Cataract Canyon. West of the Aubrey Cliffs to the Grand Wash Cliffs are vast colorful canyons, plateaus, and mountains. Prospect Canyon, which parallels the Aubrey Cliffs, provides a means of access to the high east rim of the canyon overlooking Granite Park. In this section, from Granite Park to Diamond Creek, the Grand Canyon reaches its greatest depth. The rim attains an elevation of 6,890 feet while the river at the mouth of Diamond Creek is an an elevation of 1,335 feet. From the piñon- and juniper-covered rim there are magnificent views of the brilliant canyon and the surrounding country. Hualpai Peak 72 miles to the southwest, the Music Mountains, and Peach Spring Wash are visible. To the northwest is the Shivwits Plateau. Below is Granite Park. Across the river to the north are the Pine Mountains, Parashont Canyon, and Whitmore Wash, and rising out of the red Tonto Platform like a huge ant hill is a volcanic cinder cone. The lava flow down from Mount Emma ending abruptly in Whitmore Wash and the gigantic row of red Supai windows projecting through the lava are also plainly visible. The scene is entirely different from that of the Bright Angel section but equally grand. There are fewer dramatic formations in the canyon but a greater variety of landforms and an endless horizon. 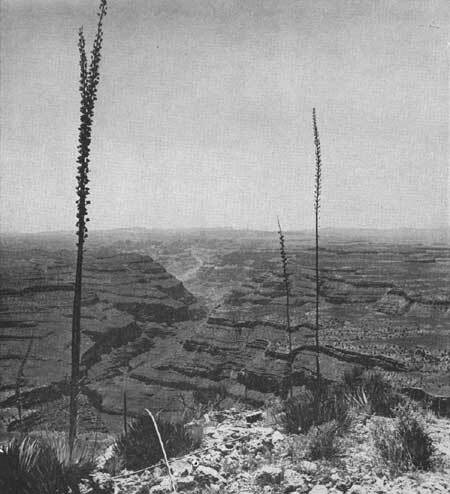 Figure 67.Burnt Springs Canyon from Twin PointGrand Wash Cliffs form the skyline. Peach Spring Draw, which joins Diamond Creek just before it enters the Colorado, provides the only natural grade suitable for a road to the bottom of Grand Canyon. Before the railroad was built to Grand Canyon Village, the old Diamond Creek Hotel near the mouth of the creek was the most popular place in the Grand Canyon. It may become popular again as an access point to the reservoir if Bridge Canyon Dam is constructed. Diamond Peak, near the junction of Peach Spring Draw and Diamond Creek, is one of the well-known geologic features of the canyon. 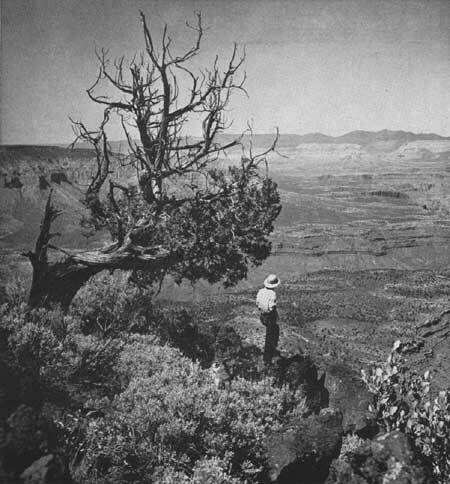 Figure 68.Looking toward Whitmore Wash and Pine Mountains from Shivwits Plateau. Spencer and Meriwitica Canyons, west of the Bridge Canyon Dam site, are fine examples of side canyons. Meriwitica Canyon is of special interest for, according to tradition, it is the original home of the Hualpai Indians. Between Spencer Canyon and the Grand Wash Cliffs the high points on the rim of the canyons offer views of canyon scenery as rugged, colorful, and interesting as any part of the Grand Canyon. North of the river the region is divided into a series of canyons and plateaus. East of Kanab Canyon is the high, pine-covered Kaibab Plateau. Between Kanab Canyon and Toroweap Valley on the west is the comparatively uninteresting Kanab Plateau. However, from the rim of this plateau as at Boysag Point, Kanab Point, and Toroweap Point, there are marvelous views of the Grand Canyon. West of the gently sloping 3-mile-wide Toroweap Valley are the Pine Mountains, a series of forest-covered volcanic cones striped by large lava flows. West of the Pine Mountains are the spectacular Whitmore Wash and Parashont Canyons. Beyond them is the Shivwits Plateau, a green peninsula in the sky flanked by brilliantly colored deserts and canyons. The Toroweap-Whitmore Wash area, including the Pine Mountains and Parashont Canyon, is the most outstanding section west of Kanab Canyon. Here are the great faults, evidences of volcanic activity, pine forests and desert vegetation, springs, deep narrow canyons, and color. The recreational value of the Shivwits Plateau is primarily in the fine views of the Grand Canyon from the rim and its remote wilderness character. However, the views are not unlike those obtained from the east rim of the Grand Canyon above Diamond Creek, and the high points along the latter rim are about 300 feet higher than Mount Dellenbaugh, the highest point on the Shivwits Plateau. All of the Grand Canyon is within areas now administered by the Federal Government through the Bureau of Indian Affairs, the National Park Service, the Fish and Wildlife Service, the Bureau of Reclamation, and the Bureau of Land Management, all of which are in the Department of the Interior, and the Forest Service of the Department of Agriculture. The eastern side of the canyon between Lees Ferry and the Little Colorado River is part of the Western Navajo Indian Reservation. From Lees Ferry to Nankoweap Canyon, the west side of the canyon is partially in the Kaibab National Forest and partially public domain. Grand Canyon National Park includes all of the canyon from Nankoweap Canyon and the Little Colorado River to Tapeats Creek. From the west side of Tapeats Creek Canyon to the west rim of Kanab Canyon, the area north of the river is part of the Kaibab National Forest. On the south side, Grand Canyon National Park extends west to include Havasu Canyon. Grand Canyon National Monument lies between Grand Canyon National Park and Lake Mead Recreational Area, the greater portion being north of the river. Lake Mead Recreational Area adjoins the southern portion of the monument on the west. South of the river, the Hualpai Indian Reservation extends from National Canyon almost to the Grand Wash Cliffs. Lake Mead Recreational Area overlaps the Hualpai Indian Reservation to include most of the Grand Canyon south of the river which is within the reservation. Bridge Canyon Dam and Reservoir.Nineteen miles northwest of Peach Springs, Ariz., in the seldom-visited western half of the Grand Canyon, the Bridge Canyon Dam may some day rise to the towering height of 740 feet above bedrock if the present plans of the Bureau of Reclamation are carried through. Exceeding Hoover Dam in height, this dam would in turn be dwarfed by the canyon. Though the dam would raise the water 672 feet to a maximum elevation of 1,876 feet above sea level, the multicolored canyon walls would tower more than 4,000 feet above the fiord-like lake. The quiet water of the lake thus created would extend upstream 93 miles to within a tenth of a mile of the mouth of Kanab Creek. At normal water surface elevation 1,866 feet, it would extend to within four-tenths of a mile of Kanab Creek. The minimum surface elevation of the reservoir would be 1,645 feet. Bridge Canyon Dam is proposed primarily for the generation of power. Coincidental with the construction of the Bridge Canyon Dam would be the construction of the Coconino Dam on the Little Colorado River 49 miles upstream from the Colorado River and the Bluff Dam on the San Juan River 132 miles upstream from its mouth. Both of these dams would serve as flood control and silt detention structures. The Bluff Reservoir also would regulate the flow of the San Juan as required by downstream power plants. These two dams are essential to the life of the Bridge Canyon Reservoir. Marble Gorge Dam and Kanab Tunnel.Following the Bridge Canyon, Coconino, and Bluff Projects in the Bureau's schedule of development would be the Glen Canyon Dam located 4.5 miles upstream from Lees Ferry. This dam would be for power development and river regulation. This project is discussed in Chapter VIIICanyon Lands of Southeastern Utah. In the 150 miles between the Glen Canyon Dam site and the estimated headwaters of the potential Bridge Canyon Reservoir at normal water surface elevation, the Colorado River falls approximately 1,260 feet. About 100 miles and 950 feet of the drop are within the boundaries of Grand Canyon National Park. To take advantage of this drop and yet avoid the construction of dams or other works in the park, the Bureau of Reclamation suggests a plan for diverting the Colorado River waters "not needed to maintain a steady stream for scenic purposes in the park" through a 44.8 mile tunnel from just above the east end of the park to a power plant on the Colorado River near the mouth of Kanab Creek. The capacity of the Kanab Tunnel would be 13,000 second feet. A 298-foot dam at the Marble Gorge site 15.5 miles upstream from Nankoweap Canyon would divert water to the tunnel. Water released from the dam for scenic purposes in the park would pass through a power plant. The maximum and normal water surface elevation of the Marble Gorge Reservoir would be 3,125 feet, the elevation of the Colorado River at the Glen Canyon Dam site, and the minimum water surface would be 3,115 feet above sea level. Proposed operation of reservoirs.According to present studies of the Bureau of Reclamation for reservoir operation in connection with the Parker diversion route of the proposed Central Arizona Project, Bluff and Coconino Reservoirs would be for the purpose of silt control. Glen Canyon and Marble Gorge would be future developments for river regulation, silt control, and power. Generally, the Marble Gorge Reservoir would be maintained at maximum content. However, during a critical year of operation the active content of Marble Gorge Reservoir would be withdrawn prior to utilizing the active content of Bridge Canyon Reservoir. Such withdrawal would be made only after the active storage contents of Bluff and Glen Canyon Reservoirs had been exhausted. Release through the Marble Gorge Power Plant would be at a uniform rate of approximately 1,000 second feet. Operation of the Kanab Power Plant would be closely coordinated with the operation of the Glen Canyon Power Plant. Normally, after full river regulation is provided by upstream storage, Bridge Canyon Reservoir would be operated at maximum content with release of water for power corresponding to releases from Glen Canyon. With this method of operation, the water surface elevation of Bridge Canyon Reservoir would normally be between 1,866 and 1,876 feet. Only in an extremely dry period would it be drawn down to a minimum elevation of 1,645 feet. The Marble Gorge Reservoir would have a maximum fluctuation of 10 feet between elevations 3,125 and 3,115.